Not every restaurant in Stowe gives a damn about the townies. With out-of-state cash driving much of the local economy, many eateries cater to the tourist crowd, offering posh, pricey food that can tip toward overwrought. Others inhabit mountain-resort clichés that straddle Alpine chalet and old-school Vermont charm but do justice to neither. It's a rare restaurant that opens specifically to serve local, affordable food to regulars in a cozy atmosphere free from pretense. But the Bench, which opened in late September in the old Pie in the Sky space on Mountain Road, aims to do just that. 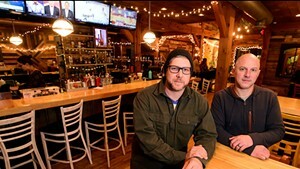 The restaurant is the latest effort from Chad Fry and Mark Frier, who also own the Reservoir Restaurant & Tap Room, another local favorite 10 miles down the road in Waterbury. Like the Reservoir, the Bench offers lots of Vermont brews and excellent pub fare, and much of the food is sourced locally. Unlike the Reservoir, there's a wood oven in the kitchen and pizza on the menu. By all appearances, the Bench team has taken the best of what works in Waterbury and applied it to Stowe, with a few fresh ideas. Former Reservoir chef Paul Moran moved to the newer restaurant, while Shawn Beede took over the Waterbury kitchen. Fry and Frier don't mince words about their comfort-food mission, and they're not shy about borrowing dishes from their Waterbury outpost. So for many locals, the Bench's bill of fare will feel familiar and homey. 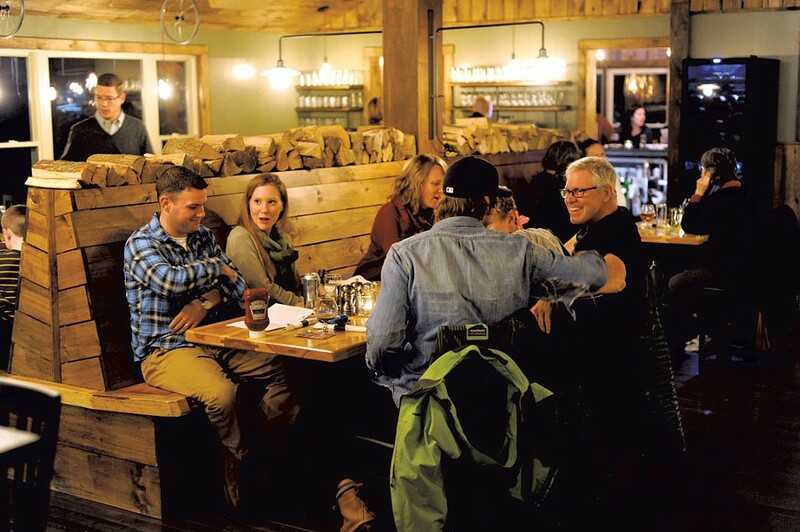 Across the menu, cleverly named dishes pay homage to the mountain and its heroes, while the 120-seat restaurant — named for an off-the-map glade at Stowe — feels thoughtfully rustic. The walls are paneled with lumber stained to look like barn boards, and Edison bulbs hang from antique wheels and other old-timey fixtures. It's hip but not terribly trendy. The space is broken up into three rooms. The small central dining room — split by a long, wooden bench — has a view into the open kitchen. Toward the edge of that room, stools at a tasting bar ring the hearth, offering diners an even closer look at the pizzas and meats roasting in the wood oven. Off to one side, another dining room can accommodate several large parties, while on the other side, beers and cocktails flow from behind a bar. The latter already hosts lively crowds and will surely see plenty of skiers in coming months. At the front door, a metal grate for boot scraping ensures that most of the snow will stay outside. Like many Vermont homes in winter, the Bench is flush with stacked wood — in the entryway and dining room, in a rack near the kitchen, beneath the expeditor's pass, where the manager checks each dish before it goes out. The wood feeds the oven that cooks the food, and warms both the kitchen and diners on a cold winter's eve. To warm the belly, the Bench offers an array of fine cocktails, each featuring Vermont-made spirits. On a recent Monday night — the second of my two visits — I was taken with the Perry Merrill, named after the so-called "father of Vermont skiing," who also established the Vermont State Parks system. This was a smooth, delicately sweet drink made with Barr Hill vodka, syrup-poached pears and a bit of sparkle. In contrast, my husband, Dan, ordered a WhistlePig Hot Toddy. A darker, dirtier tipple the color of murky cider, it was tinged with whiskey, cinnamon and a clove-punctured lemon slice. The wine list offers a range of vintages from Italy, France and California. And every night, the Bench's two house wines are available on draft for about $6 a glass. When it comes to liquids, though, beer is rightly the focus; it pairs particularly well with comfort food. 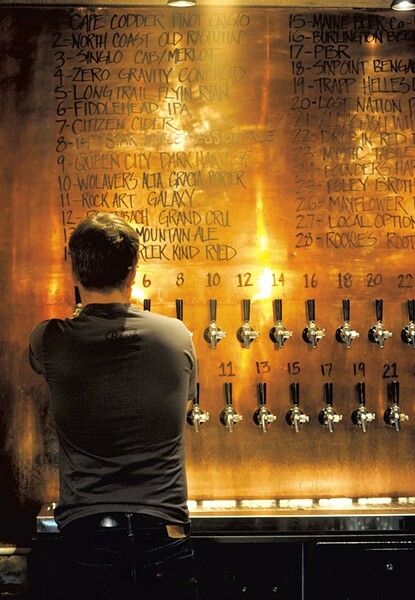 During my first visit — a cold Friday in November — my table ordered from the draft list, which is 25 beers strong. My Rock Art Galaxy IPA married well with poutine — a holdover from the Reservoir. "This is just stupid," my husband said happily, staring at the massive dish heaped with crisp, hand-cut fries, local curds and gravy made with Shed Mountain Ale. Though the portion was laughably large for an après-work meal, we decided it would be just about right for someone who had spent the day on the mountain. And at $8.99, it's an entrée-size dish that even a ski bum could afford. 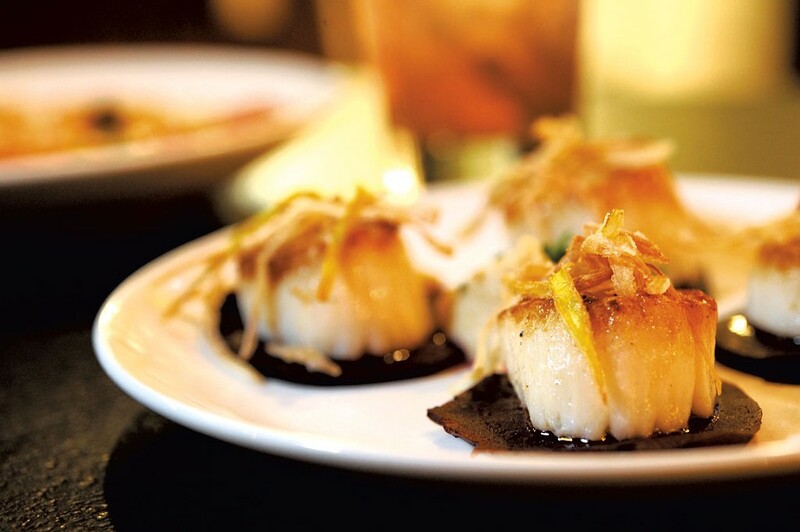 A more modest and beautifully balanced appetizer came in the form of four seared scallops, perched atop discs of beet and arranged around a mound of mashed parsnip. A true palate warmer, the dish offset the beets' sweet acidity with sea-creature brine and rich, vegetable-nut parsnip notes. After a few gooey bites of poutine and a scallop or two, I started to feel sublimely satisfied. And much to my surprise, I caught myself thinking it was one of the best meals I'd had since returning to live in Vermont earlier this year. Within minutes, though, a mishandled duck brought me down from that warm-and-fuzzy high. Roasted for a bit too long, the bird's plump breast and confit leg were depressingly dry and overcooked. All that remained of its rich, fatty potential was a vaguely woody odor; the meat was gray through the middle. Served in a sizzling cast-iron skillet, the dish was impressive to look at, but the poor, sad bird had been skilleted to death in the hot oven. I wanted to cry. "This was ... just such a gorgeous piece of meat!" I stuttered to my husband, simultaneously fighting back tears and laughing at my ridiculous reaction. In a rare move, I sent the dish back to the kitchen. The Bench handled it quickly and well. The staff admitted the duck was too well done (the kitchen's default temp for duck breast is medium, with lots of pink in the middle). With impressive candor, our server explained that finishing the tender fowl in the wood oven can be tricky with the oven's variable temperatures, especially when the restaurant is busy, which it was. We ordered a pizza instead, and I nibbled Dan's housemade ravioli. Swimming alongside blistered cherry tomatoes in garlicky tomato-vodka sauce, the Italian dumplings were stuffed with a savory blend of ricotta, garlic, prosciutto and basil. The sauce was so good that we wanted bread to sop it up. My duck-consolation pizza came quickly. We went for the Rastaman, a red-sauce pie topped with sausage crumbles from Vermont Smoke and Cure, mozzarella and caramelized onions. The housemade crust was both crisp and doughy (though not particularly thin) and formed a fine base for the excellent toppings. The pizza menu included a mix of creative (confit duck, truffle oil, poached pear, Brie) and standard (Margherita) pies. Five of the six flatbreads were grounded in either red sauce or truffle oil; the sole outlier was drizzled in extra-virgin olive oil. I was somewhat perplexed that there were no white pizzas on offer. During my visits, service was attentive in that exceptional, barely-there-but-always-on-it way. 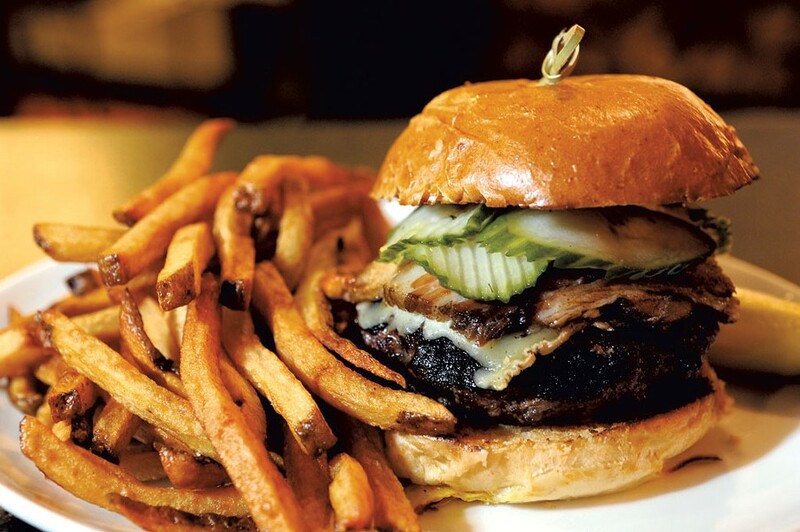 On the Monday night, a food runner delivered my Bench burger — a big, beefy patty stacked with thick-cut local bacon, unctuous Inspiration cheese from Mt. Mansfield Creamery and onions caramelized with balsamic vinegar. The side of mayo I requested was on the plate, but there was no ketchup. The moment I noticed its absence, our mind-reading server was there. "Ketchup?" she asked, and delivered the condiment in less than a minute. The burger was a beautiful, meaty monster, cooked a perfect medium-rare. But, unlike so many other patties I've loved, this one held together and stayed more or less within the confines of its fluffy brioche bun. That night, my husband's two thick slabs of meatloaf (another Reservoir Stowe-away), made with a blend of local pork and beef, were smothered in the same pungent ale gravy as the poutine. The dish — grand enough for two full meals — came with salty, creamy garlic mashed potatoes and grilled zucchini. For dessert, the Bench offers simple, well-executed sweets, such as a stellar apple turnover with warm, thin-sliced fruit folded into a flaky pastry pocket and topped with a scoop of vanilla ice cream. On the night of the duck debacle, a s'more lightened my spirits and sent me home happy. Chef Moran's graham-cracker-chocolate sandwich is stuffed with airy, housemade marshmallow and fired in the oven until the marshmallow swells into a pillowy pile. On that night, it spilled over the crackers in a gooey mélange that recalled a night spent huddled among the trees in a quiet, wooded glade. The original print version of this article was headlined "To Locals, With Love"